The Walking Dead has become a huge franchise spawning a hit t.v. show of the same name, a spin off show "Fear the Walking Dead", and multiple video games, and it all started with this comic right here. The Walking Dead was created by Robert Kirkman and Charlie Adlard. 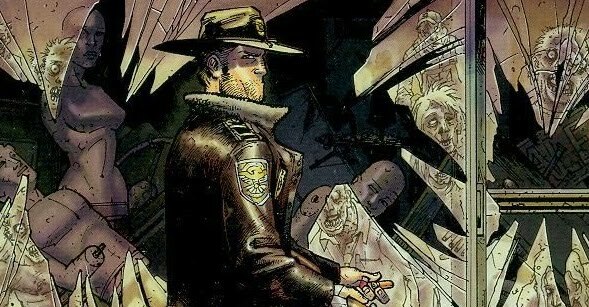 The comic series had a small following at first, but it didn't really take off until after the show debuted on AMC in 2010, then prices for the early, high grade comics started to go through the roof. I'm not sure that Image Comics had a lot of faith in this series when it first came out in 2003. There were only an estimated 7,266 copies of The Walking Dead #1 produced. Needless to say, with so few first print copies and the huge success of the show, prices for a copy of this comic are now through the roof. I'll get into some sales prices in just a little bit. For now lets talk about the comic. If you've seen the first episode of the T.V. show, then you pretty much know what happens in this issue, because they are very similar. Rick Grimes and Shane are cops, and Rick gets shot while on duty. He wakes up in an abandoned hospital not knowing anything of the zombie apocalypse. As he makes his way back to his house to check on his family, he runs into Morgan Jones and his son Duane. Actually, Duane whacks Rick on the back of the head with a shovel thinking that he's a zombie. When Rick comes to, he gets himself geared up to continue his search for his wife and son. If you've never read this comic, but have seen the show, it should sound very familiar. Like I said, this issue is very similar to the first episode. There are a lot of variant covers out there for The Walking Dead #1. According to goCollect, there are at least 47 different covers for this comic. A couple of them look similar to the first printing cover, so if you're looking to buy, then pay attention. You don't want to overpay for a reprint. There are a lot of Wizard World variant covers out there too. They handed out 2 variants of this comic book at most, if not all, of the conventions that they held last year. A sketch and a color variant. I've included a picture if you're not sure what I mean by "sketch variant". If you're a fan of variant covers, there are plenty of them for you to choose from. As I've already stated, the print run on The Walking Dead #1 is small, but a lot of these copies have already been graded. Of the 7,266 printed, 2,436 have been graded by CGC, mostly in high grade 9.0 or higher. The highest graded copies on the census are 9.9 and there are a whopping 23 of them. That's not too surprising for a comic that came out after CGC was around. Some people probably bought a copy and immediately sent it off to get graded. Now when I said that prices for high grade copies went through the roof, I wasn't exaggerating. The latest sale on eBay, for a ultra high grade, 9.9 copy sold for a staggering $22,825 on March 18 of this year. I'm completely dumbfounded by that number. I mean, I knew that high grade copies were expensive, but over 20 grand? Give me a brake. 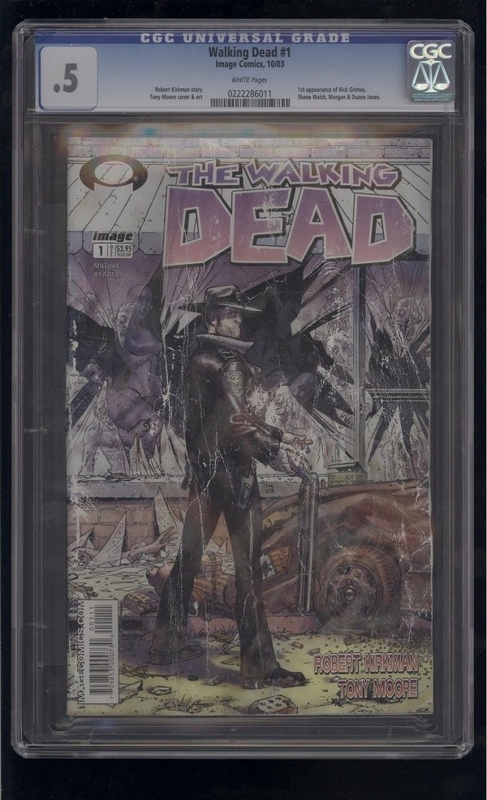 There is a CGC 9.9 copy for sale right now on eBay for $28,525 and another one at MyComicShop for $25,000. Yikes. Those are way out of my price range. Even 9.8 copies are quite pricey, selling for well over $2,000 right now. If you were lucky to snag one of these off of the shelf in 2003, congratulations. I must say, I'm a little jealous. There is one copy out there that is in the worst 0.5 condition that has actually gotten some attention. Back in 2014, this copy sold on eBay for $756. As you can see from the chart above, that is more than the average of a mid grade 5.5. Why would someone pay that much for a comic in that condition? Sure, there is only one copy at that grade, but it's not too hard to take a nice looking comic and make it look like garbage. Leave it out in the sun for a few days, crease the hell out of it, and just for good measure, throw a few tears into it. 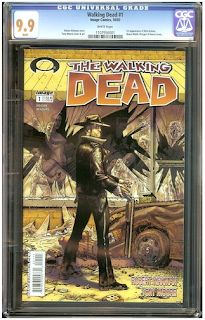 If I knew that a lowest of the low graded copy of Walking Dead #1 could fetch that much money, I'd find a cheap 4.0 copy at a shop or convention and abuse the hell out of it. But hey, I didn't buy it. If someone was willing to pay $756 for it, then good for them. I'm not sure I would have though. If you're looking to get a rare, first print of The Walking Dead #1, it's probably going to be a little bit of work. Since there are so many variant covers out there, trying to weed out the one you're looking for may take a little bit of time, but I wish you luck on your hunt.